If you don’t think you are a good choice for a residency site, think again! Years ago Dr. Tori Hudson started talking to me about the possibility of taking on a resident in my clinic. I thought that my area of interest—care of midlife women—might be too narrow for creating good residency training. I also worried about cost. Would having a resident decrease my own income? Did I have enough patients to start sharing with a resident? I also had to face and assess my own confidence about teaching a resident. Here’s what I know now: I have been in practice for 25 years. Any practice that old has an idiosyncratic bent. I have developed a niche practice that has focused many hours of continuing education and experience in caring for women from 35 to 65 years. I do their primary care. To be good at that I have developed a broad and textured referral network with the conventional community, the naturopathic community, the counseling community and the alternative community. It is not uncommon for me to refer to another naturopathic doctor who is skilled in an area I am not. In 2008 my practice attracted Dr. Jeff Roush, a 2006 Bastyr University graduate who has developed skills in prolotherapy, neuromuscular reeducation, and pain management—things I don’t do. After this much time in practice you know how to manage patient care. You have come to your own way of getting a history and making a plan. You know what to do with patients who are challenging, either medically or personally. You have a clinic that runs reasonably well. Trust me on this, our newest graduates benefit from, and need exactly the information that you worked all those years to learn on your own. A residency in your clinic will help a new doctor get a jump start. Dr. Roush took my experience and, as I only work half time, out earned me in his 6th year in practice. We started with our STAIR resident, Dr. Jessica Hancock, in October 2012. We’re starting another young doc in October and our plan is for Dr. Angela Carlson to reach Dr. Roush’s level or productivity even sooner than he did. My life is so much easier with a resident. Dr. Hancock is returning nearly all patient phone calls, tending to the prescription refills, is able to fill in at the front desk, and after the first six months she has been able to see many routine patients on her own. I check in with every patient, but now while she is doing a routine annual gyn exam, I have time to do other things—including sharing my experience with you. Financially, programs such as STAIR are a great benefit because someone else is paying her salary while we are able to retain any revenue she produces. As a resident becomes valuable to you, you may want to share some additional income with the resident as well. But it’s not required. Initially getting your resident trained takes more time. At about that six month mark it adds up to doing less work, and earning more money. 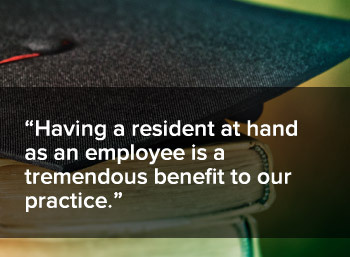 Having a resident at hand as an employee is a tremendous benefit to our practice. Our patients are getting excellent care. We love teaching. When you have explained certain processes or functions for the 14th time that week, it’s great to have someone else do that and be teaching them all of you have learned about the variety of thyroid presentations, labs and different treatment strategies. We want this level of support to us and this level of care for our patients all the time. STAIR has given us the opportunity to assess this and we know now that even paying for a new doc ourselves will be a financial and professional advantage. It is a joy to watch a new doctor advance so quickly. Our whole profession, and it’s future, will benefit from your consideration of a residency in your clinic. Call me if you want to talk - 406.431.9207. Dr. Nancy Aagenes is the Residency Director at Natural Medicine Plus in Helena, MT. The depth and maturity of Dr. Aagenes' commitment to patient care is reflected in every aspect of her work. Dr. Aagenes has practiced naturopathic medicine and acupuncture in the Helena community since l989. She earned her naturopathic doctorate at Bastyr University in Seattle, has passed the exam in menopause competency given by the North American Menopause Society, served as president of the American Association of Naturopathic Physicians (AANP) from 1999 to 2001, and served eight years on their Board of Directors. In 1991 she was named Naturopathic Physician of the Year by the AANP and continues to be recognized as a leader in both medicine, and in her legislature work for naturopathic laws in Montana.